Not sliders, but they look pretty. The 8 oz. Burger Bar in Melrose has intrigued me for a long time. It combines two of my favorite things, burgers and bars, into one, so I knew eventually I would have to see how well that combination works. I recently got my chance and even went online to check their menu before going. 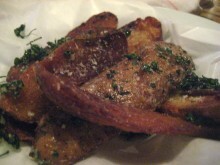 On that menu I saw something that made me want to go even more: Fried Wisconsin Cheese Curds. Cheese curds are one of my favorite things in the world and although I prefer them un-fried, I will eat them anytime I see them offered. Excited about these curds, I stepped into 8 oz. Burger Bar. Then I looked at their menu and almost cried. No cheese curds. Quick, unvegan, think fast. There could be a good reason for this. Maybe they are kind of a secret dish only for people who read their menu online. Perhaps they were recently added to the menu online yet, but they hadn’t printed out the new menus for the restaurant yet. Still full of hope, I asked the waitress and she replied that they no longer served them. Drats! I mean how hard is it to take them off the online menu? I checked today and they are still there. Had I never known about the existence of the curds, I would have been happy in my ignorance, but seeing them on the menu online and not actually serving them gave my visit an immediate bitter taste. We tried to salvage my disappointment by ordering a few sides. 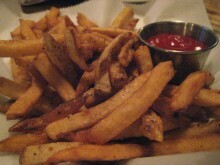 These were the fries, sweet potato chips and truffled potato skins. Nothing like a few good starches to get your stomach warmed up. Each of these appetizers tasted good in their own ways, so I didn’t feel like I was getting a potato overload. 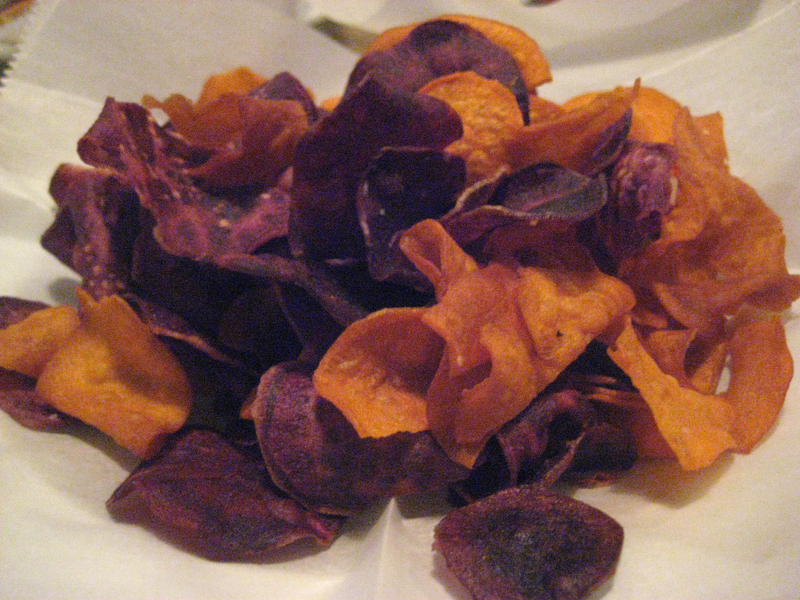 The sweet potato chips were both the orange and purple variety, which didn’t really taste any different, but were a nice touch. The potato skins were like none I have ever had before, topped with truffle oil and a light cheese and further cemented my thoughts that truffle oil makes everything taste better. They tasted quite good and were a nice change from the typical potato skins loaded with cheese and bacon (although those are always delicious). The fries were Kennebec…whatever that means. To me it just meant they were pretty damn good. Crispy on the outside and soft on the inside. But enough about the sides, you say, on to the burgers. 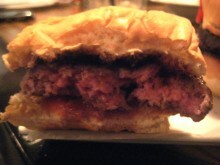 Well their normal burger options seemed pretty uninspired from my unvegan point of view. Some started out strong, but then threw in items that would have just ruined them (vegetables). Instead, I ordered their Suds & Slider Sampler. This intrigues me because it offered up a couple of meats not found in ordinary burgers, namely Niman Ranch lamb and wild boar. 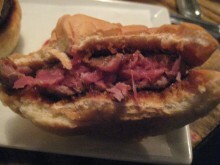 The third slider was triple prime beef. 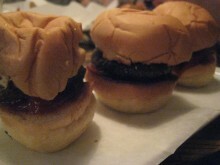 I knew these wouldn’t be sliders in the real sense, but I thought the mini burgers would be nice. When they came, I ate them in the order requested of me. First was the wild boar. This burger was cooked extremely rare, which is supposedly necessary with wild boar because otherwise it could get too tough. The flavor was very different from pork, and I think that’s a good thing. Next came the triple prime beef burger. This was a great blend and a great grind. Finally, I delved into the lamb burger. Of the three, this was definitely my favorite. It had a nice taste and was the best-cooked of all. And finally some pink lamb. Just a few comments on the burgers in general. First off, the menu says that they are cooked medium rare to medium. This was a bit of an overstatement, because these burgers definitely seemed to straddle raw and rare. Some people love this, but I don’t know why. The meat in the middle of the burgers, especially the beef one, had a sort of slimy texture that is usually the result of uncooked meat. I couldn’t even finish the beef burger because of this. Also, the buns were pretty big for the size of the burgers. Maybe they just needed to be squeezed down a bit, but I shouldn’t have to open my mouth as wide as it goes to bite into mini hamburgers. The burgers also came with beer pairings to fulfill the “suds” part of the sampler. I honestly have no recollection of what these suds were, except that they were pretty good and were well-matched with the burgers. Each one was 5 oz., which was just enough to satisfy my thirst. One thing that 8 oz. 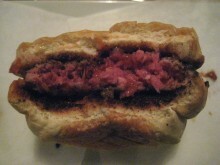 Burger Bar has, that some pretentious burger places don’t, is the ability to customize your burger. This is a great option for unvegans, although I didn’t partake in this option. This restaurant has a lot of potential to be great, starting with remedying the cheese curds situation and finishing with cooking their burgers for a length of time not broken down into nanoseconds. If they could take care of these things, 8 oz. Burger Bar could be great, but until then I can find a better meal elsewhere. I HATE it when companies dont keep their sites up to date, your right its not that hard & I have had similar situations where you look online have your heart & mind set on something then get snubbed because something was out of date ARGHHH! Those sliders should have been cooked to what was advertised unless you asked for rare & those are extremely rare & like you say like;ly raw in some parts. They need to get a grip! I’ve been wanting to try this place for quite some time, but now that I’ve seen those burgers… it just looks sick. Not appetizing one bit!